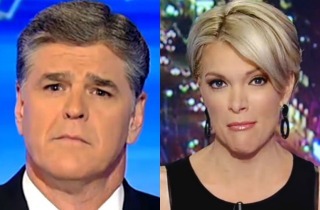 Tensions at Fox News Channel, which have been clearly simmering for weeks, finally boiled over very publicly last night as Megyn Kelly said on-air that Donald Trump strongly prefers to go on Sean Hannity’s show because it isn’t an “unsafe space.” Hannity, clearly concerned about defending his own honor as well as that of his “significant other,” immediately turned to Twitter to accuse Kelly of the worst sort of blasphemy one could commit as a host on Fox News, being a Hillary Clinton supporter! I have written here often in recent months about how Sean Hannity is largely to blame for Donald Trump’s nomination and the ensuing Clinton presidency which will very likely flow directly from that ratings-driven fiasco. I have also theorized that Hannity has been melting down because he knows, at least at some level, that Trump’s impending loss is both nearly inevitable. But this episode went far beyond Hannity just “jumping the shark.” He is now closing in on “Hitler in the Bunker” sort of anxiety and insanity. In fact, while the Hitler/Nazi analogy is way over-used (even with Trump), Hannity scolding Kelly for an apparent lack of complete blind allegiance to his leader felt very much like an SA officer yelling at a fellow Stormtrooper for refusing to give proper respect. Kelly’s original statement was both absolutely true and completely appropriate. Trump obviously limits himself on Fox News these days to being interviewed by Hannity and “Fox & Friends” where he is sure to get by far the softest and most fawning interviews. With the facts against him, Hannity had no substantive retort. In such situations it is usually best to simply shut up and pretend it didn’t happen. After all, his rabidly pro-Trump audience would take such criticism coming from Kelly, who famously feuded with Trump during the primaries, as a badge of honor. Forgetting the childishness of this episode for a moment, Hannity’s “retort” has a far larger meaning in this insane election, which has caused an even more catastrophic conservative “crack up” than the one I predicted here over a year ago. Have we really fallen to the point where even Fox News stars are “Clinton supporters” if they dare to simply acknowledge an obvious negative reality about Trump? (Considering that Trump has a vice-presidential nominee who can go through a whole debate pretending that actual Trump statements never really happened, I guess this new “pledge of GOP allegiance” shouldn’t be all that surprising). Is Hannity now becoming the Joe McCarthy of the “conservative” media? On his next show is he going to dramatically declare, “I hold in my hand the names of 205 employees of Fox News Channel who are supporters of… Hillary Clinton!!”? Personally, I have been called a “Clinton supporter” quite often on Twitter and Facebook because of my consistent criticism of Trump (which I have always found very odd since, unlike Trump, I have never given her any money to her or invited her to my wedding). But I am obviously not Megyn Kelly and those who have leveled this irrational charge don’t work with me and are usually, though not always, people who don’t even have a name or a face attached to their account with about 37 followers. For Sean Hannity to stoop so low, so quickly, against the woman who is considered to be the biggest star at his own network tells us something else is really going on here. The only way for a meltdown that dramatic to be provoked so easily is that Hannity is starting to panic. Hannity is an unimaginative host, but he is smart enough to read the polls (the scientific ones, not the online variety he suddenly fell in love with during his romance with Trump). He must know that Trump is fast approaching the point where he needs an act of God to win this election and, if Sunday’s debate goes as poorly as the first one for his candidate, that we could be looking at an Electoral College blowout on November 8th. If Trump loses soundly (badly enough that even his sycophants like Matt Drudge and Breitbart can’t claim it was “rigged,” or that the tiny percentage of Republicans who are “Never Trump” caused the loss) then Hannity has to know that he is in big trouble. Many real conservatives will blame him and others for having duped them into thinking that Trump could beat Hillary, when in reality he might have been one of the few major GOP candidates to whom she could not lose. old reliable patrons abandoned him in droves like a badly exposed snake-oil salesman. There are many who have theorized that Hannity has the ultimate fallback of being the primary host on the rumored “Trump TV,” which theoretically would be created after such an election loss. I truly hope this endeavor happens because it is the only way that any of the Trump sell outs will ever be made to truly pay (at least here on earth) for their betrayal to the conservative cause and for giving us Hillary for at least four years. That’s because I believe that such a venture, especially at this precarious time for media outlets in general, would be at least as much of a colossal failure as Trump’s mortgage company which he launched just before the real estate collapse of 2007 (and which, remarkably, hasn’t yet emerged as a major issue in this campaign). There isn’t often justice in this increasingly strange world, but a Trump loss followed by the creation of a sure to fail “Trump TV,” might just be the ultimate exception which proves the rule. UPDATE –– 10:22 pm ET: Both of them appear to have made up. More here.